Would you like to live in a tobacco-free community? Read my interview with Courtney Smith, the Outreach Coordinator at the Southern Adirondack Tobacco Free Coalition (SATFC) to find out what they do, and what you can do to help make your community tobacco-free. 1. What does the SATFC do? The SATFC is a grassroots coalition of local agencies and community leaders committed to creating healthy, tobacco-free communities. SATFC has been serving the Adirondack region for over ten years while focusing on three main initiatives; decreasing tobacco marketing and advertising aimed at youth, increasing tobacco-free outdoors policies, and working with landlords and property owners on smoke free housing. 2. What areas does the SATFC serve and how is it funded? SATFC serves a three county region of the Adirondacks: Saratoga, Warren and Washington counties and is a program of The Prevention Council of Saratoga County. The Coalition is funded by the New York State Department of Health, Tobacco Control Program, and is one of 30 such partnerships across the state. 3. Why did you become involved with the Tobacco Free Coalition? I came to work for The Southern Adirondack Tobacco-Free Coalition four years ago, having previously worked in youth services as a professional Girl Scout. I was attracted to the work the coalition did for a number of reasons, being a parent of a young child at the time, secondhand smoke exposure at store entrances was extremely frustrating to me. Additionally, what interested me the most was the policy driven approach to community health the coalition uses, the idea of changing the system as opposed to throwing band aids at the issue. Instead of working one on one with smokers to assist them in quitting, the coalition uses policy work to change the social norm on tobacco use, creating tobacco-free environments, protecting individuals from second hand smoke exposure, and making it easier for those who would like to quit. 4. What work have you done at the Coalition that you are especially proud of? In the last four years I have worked with a number of local municipalities to create tobacco-free recreational sites, such as parks, playground and beaches. The Town of Queensbury, City of Glens Falls, Village of Granville, and Town and Village of Whitehall were all municipalities I have partnered with through my work with the coalition to create healthy outdoor tobacco-free spaces. Being a parent of a young child living in Queensbury, I am especially proud of the work I did with Supervisor Stec and the Town Board to make my home community safer for our youth. 5. What is the biggest issue in tobacco control that is threatening our youth? Tobacco marketing and advertising such as colorful, well lit cigarette displays at store registers have been shown to make kids more likely to start smoking. In 2008, the tobacco industry spent 90% of their 10.5 billion marketing dollars at the point-of-sale. (Source: Retail Advertising Tobacco Study 2001, data analysis conducted by RTI, International.) Tobacco companies spend more money to market cigarettes than the junk food, soda, and alcohol industries combined. Studies show that kids are twice as likely as adults to notice and remember retail tobacco advertising in stores. 6. What are some of the steps you take to try to curb tobacco marketing aimed at youth? 7. Why do tobacco companies target kids who are too young to buy their products anyway? Tobacco companies refer to them as replacement smokers, we refer to them as our children. To remain profitable tobacco companies must attract "replacement" smokers, about 85% of whom start before the legal age of 18. Personal Note: While this quote is nearly 30 years old it is easy to see this mentality is engrained into Big Tobacco and their attentions remain focused on our youth today. 8. Do you offer help to people that would like to quit, but can't? The New York State Smokers Quitline is available with information and resources to assist smokers, their family and friends. Nicotine replacement therapy is also available to those who qualify. The Quitline 1-866-NY-QUITS/1-866-697-8487 or online at www.nysmokefree.com. New York State Smokers Quitline is operated by the New York State Department of Health and Roswell Park Cancer Institute. 9. How does an organization go about transforming their property into a tobacco-free zone? Do you help with this? As public tolerance for secondhand smoke (SHS) decreases, the desire for smoke-free outdoors environments has increased. SATFC offers assistance to any municipality, business or community organization that is interested in creating tobacco-free grounds or entryways. 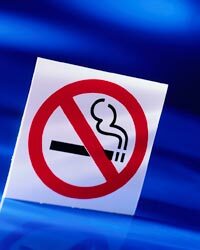 We provide guidelines on how to make the environment tobacco-free. These services include presentations to employees and boards on the benefits of tobacco-free grounds, supplying of information on cessation resources, providing technical assistance with sample policies, and creation of free custom made tobacco-free outdoors signs. 10. Why does the SATFC focus on smoke-free housing? Throughout New York State and across the country, apartment owners have begun to embrace a non-smoking policy as an amenity they can provide for their residents. Why? Smoke-free buildings save money, attract tenants, protect lives and property, and can safeguard against liability.